Do you have 18 hours a week to help our students improve their reading and math skills? Join Minnesota Reading Corps or Minnesota Math Corps!! As a tutor, you’ll serve three days a week and work one-on-one with students who need extra help. Tutors receive $225 every two weeks and also earn an education award of $1,230 that can be used for college tuition or student loans. Tutors 55+ can gift the award to their child, grandchild or foster child. Learn more and apply at www.readingandmath.net or contact the school office. Don't Forget to stop out to our FRIDAY FOOD SHELF! Volunteers needed at our NEW Weekly Food Shelf! Please consider volunteering at our NEW Food Shelf. The Food Shelf that is brought out to our Middle School location (643 Virginia Street) every FRIDAY is in need of volunteers! Click the link below for more information or to sign up to help out! We still have Minnesota Reading Corps positions open at SPCS! Please help us fill our last few Scholar Coach positions at our school! These are paid positions through Minnesota Americorps. If you or any of your friends or family would enjoying helping our students develop their reading or math skills click the links below to apply! 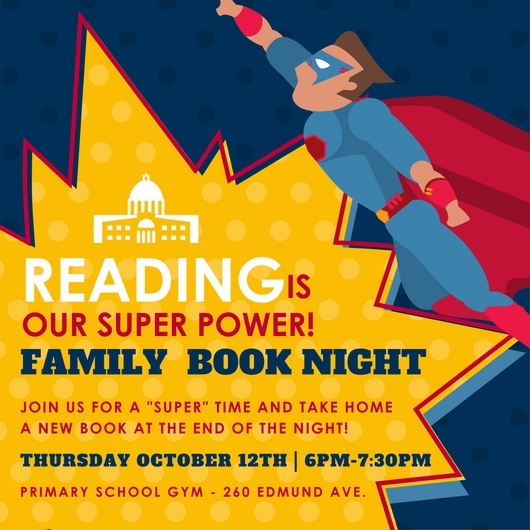 Mark your calendars Family Book Night is October 12th! We are so thankful to CenturyLink for donating backpacks to many of our students! The kids really loved getting to meet the MN Vikings Cheerleaders too! I am so excited for the new school year to begin! Stop by our primary school building (260 Edmund Ave) on August 31st between 4pm and 7pm for our annual Back to School Night! Parents and guardians please plan to come talk with your children’s new teachers, get help with lunch applications, ask transportation questions, order uniforms and meet all of our wonderful new staff. Also, this year we are starting a UNIFORM TRADE-IN: Bring in your gently used uniform shirts that no longer fit and get $2.50 coupons to use towards new uniform shirts! Students come meet your new teacher and be entered in a prize drawing! Primary students can get a sneak peak at your classroom and middle school students can pick up your schedules! Únase a nosotros el 31 de agosto entre las 4pm y las 7pm a nuestra Noche de Regreso a la Escuela. ¡Padres por favor vengan a hablar con los nuevos maestros de sus hijos! También pueden obtener ayuda con las solicitudes de almuerzo, preguntas de transporte y pedir camisas de uniforme. ¡Los estudiantes que vienen a conocer a su maestro serán inscritos en un sorteo! En este nuevo año pueden entercambiar camisas de uniforme que ya no caben para un cupón de $2.50 para obtener nuevo camisas de uniforme. A huge THANK YOU to Red Balloon Bookshop for donating a copy of each of this year's Children's & Teen Choice Book Awards Finalists! Our students were SO excited for all of the new AMAZING books!! Stop by the Red Balloon Bookshop to say Thank You and to pick up some books for yourself too! Don't miss out on all the FUN...take a look at all of the events going on in the final days of our school year! Help send our wonderful band students to Music Camp! It appears at this time that Gmail has been compromised nationwide with a malware worm. Please be careful not to open any email messages that invite you to share a file (see images below). It is not yet known what the ill effects might be if you clicked on the blue box entitled "Open in Docs” and then clicked "allow" on the Google Docs share screen. If you did click the blue box but did not grant access to your Google Docs you should be okay. However, if any user clicked on the blue box and then clicked "Allow" your email may have been compromised. It appears that the intent of this worm is to harvest email addresses and potentially to gain access to your emails. For now, please delete any email messages that are similar to the sample below. Sunrise Bank helping raise money for SPCS! Watch the check presentation of our $5000 grant from the Fastbreak Foundation! Ann Bancroft Dare to Dream 20th Anniversary Celebration! Over the years, we have had several SPCS girls receive grants from the Ann Bancroft Dare to Dream Foundation! In fact, in their twenty years of giving out the grants no other school has received more grants that we have here at St. Paul City School! We were honored to be a part of their 20th anniversary celebration! Our director Nancy Dana along with several staff volunteers and 9 middle school students helped out at the special event! Our students were even spotlighted in the video presentation during the event! SPCS in the Local News! Click here to download the April 2017 Issue of Eagle Eye News!